Canon made an interesting sensor-related announcement last week. For $500, they’re offering to upgrade EOS C100 Digital Video cameras with the new Dual Pixel CMOS AF feature that was introduced in the EOS 70D digital SLR (watch our Canon EOS 70D intro video).Canon’s Dual Pixel AF uses a split-pixel sensor design to offer significantly better continuous auto focus performance in live view / movie mode than was previously available in Canon DSLRs. 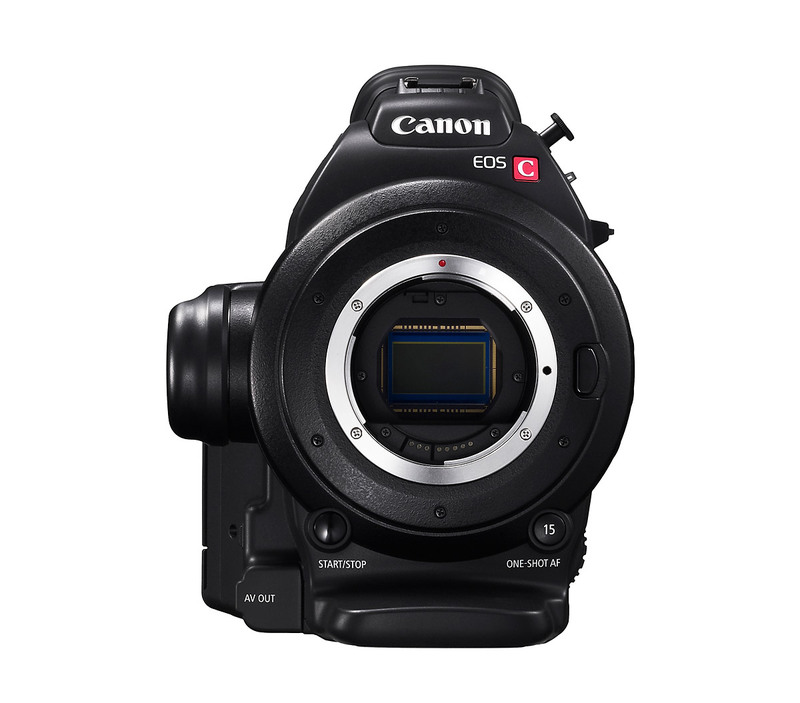 This is a big upgrade for the C100 and the first time Canon’s EOS Movie Servo AF continuous auto focus will be available in something other than a consumer or prosumer DSLR. The Canon EOS C100 Digital Video camera is part of Canon’s Cinema EOS family of professional DSLR-based video cameras. It was introduced in late 2012 and sells for about $8000. It has an 8.3-megapixel “Super 35mm” 16:9 CMOS sensor and it’s compatible with all of Canon’s EF and EF-S lenses. The Dual Pixel CMOS AF upgrade adds a continuous auto focus area to the center of the C100’s frame. The area is about 20% of the height and 25% of the width of the frame. 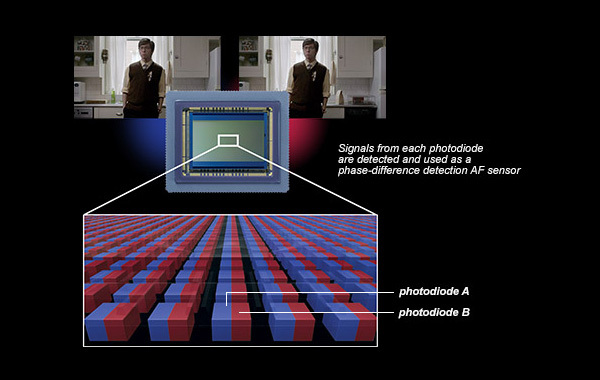 Canon says, “Dual Pixel CMOS AF technology helps provide smooth and consistent autofocus, so that pans are natural looking with subjects remaining focused even as they move.” Canon says the combination of phase detect and contrast detect auto focus also speeds up single-shot auto focus performance. Besides adding the excellent EOS Movie Servo AF to the EOS C100, the Dual Pixel AF upgrade has some interesting implications. Adding Dual Pixel CMOS AF has to be more than just a firmware update. The sensor would have to be replaced as well – wouldn’t it? Apparently not. Thanks to DPReview for pointing this out because the Canon USA announcement is pretty vague, but Canon’s European press release says the C100 was designed with a Dual Pixel AF-compatible sensor. So much for this announcement being fuel for rumors of a new camera. It is a big deal for video, though. Until recently, Canon’s EOS Movie Servo AF was something you only got in consumer cameras like the EOS Rebel T5i / 700D. The EOS 70D was the first prosumer camera that got continuous auto focus for video. And now it will be available in Canon’s professional-level EOS Digital Video cameras, as well. Another implication of the Dual Pixel CMOS AF upgrade is that Canon probably has pro-level Stepping Motor (STM) lenses in the works. The STM lenses were introduced with the EOS Rebel T41 / 650D. They are specifically designed to work with the EOS Movie Servo AF, with quick, silent and smooth focusing in movie mode. The EOS Movie Servo AF works with almost all of Canon’s EF and EF-S DSLR lenses. However, there’s a very noticeable difference between focusing performance with a standard lens and one of the new STM lenses. Non-STM lenses make a lot more noise that can be heard when recording video, and they hunt a lot. The STM lenses are silent and focus much more smoothly and naturally. But so far there are only four STM lenses. And, with the exception of the EF 40mm f/2.8 STM prime, the STM lenses are all consumer-grade zooms. I’ve been wondering when we might start to see the STM focusing motor in more robust, higher performance lenses. If Canon is putting the Dual Pixel AF in the EOS C100, I’d be willing to bet that we’ll see some better quality STM lenses soon – maybe even with L glass! By the way, I’ve been testing the EOS 70D’s Dual Pixel CMOS AF for video and I am impressed. I’ve shot some mountain biking and cyclocross racing clips and it works great. I’m working on a Dual Pixel CMOS AF sample video so keep your eyes open for that. 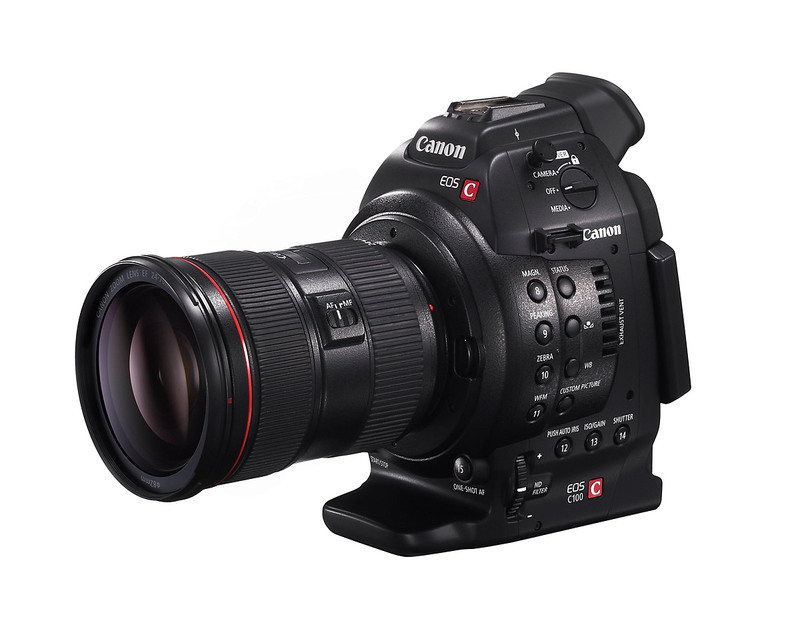 The Canon EOS C100 Digital Video camera upgrade is supposed to be available this coming February. It will cost US $500.